Attack 1 : White Kyurem Ev. When this attack is used, Kyurem fuses with Reshiram to form white Kyurem. Must have Kyurem with to fully evolve. Adds 150 hp to existing health. Attack 2 : Black Kyurem Ev. 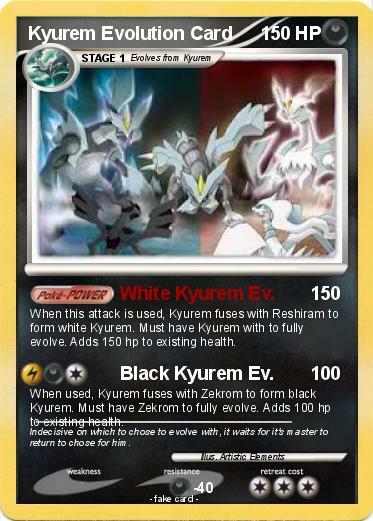 When used, Kyurem fuses with Zekrom to form black Kyurem. Must have Zekrom to fully evolve. Adds 100 hp to existing health. Comments : Indecisive on which to chose to evolve with, it waits for it's master to return to chose for him.